The digital revolution is in full swing, not just in the corporate sector. An increasing number of communities, towns and cities are undergoing a transformation. As part of the revolution, Bonn's mayor Ashok Sridharan launched the Digital Bonn initiative in early 2016. Ever since, various representatives from Bonn-based companies, government agencies, the scientific community and non-profit organizations have been involved in developing concepts which the city can implement to accelerate the transformation process. Today, Mr. Sridharan presented selected proposals at the Telekom Design Gallery. "Our aim is to transform Bonn into a true smart city," announced Deutsche Telekom CEO Timotheus Höttges in his talk on the Digital Bonn initiative. And Deutsche Telekom would consequently play a major role in networking the city. "Networking is the key to digitization and is also the core competence of our Group." Mr. Höttges is a member of the Advisory Board – a kind of supervisory board for the project initiative – whose aim is to further consolidate Bonn's position as an attractive location for the digital market. "Bonn needs a faster network, and we are going to push ahead with its expansion," stressed Mr. Höttges. "By late 2017, we will have set up 200 HotSpots to offer free WiFi at all major locations in downtown Bonn and be able to provide a bandwidth of 100 Mbit/s to 40 percent of Bonn households through vectoring." Today, 22 percent of the city benefits from an LTE bandwidth of up to 300 Mbit/s while 95 percent boasts a speed of up to 150 Mbit/s." Digitization, as Mr. Höttges explained, makes people's everyday lives easier. It could also help in establishing a more citizen-centric administration – for instance, one in which business registration formalities can be completed online. 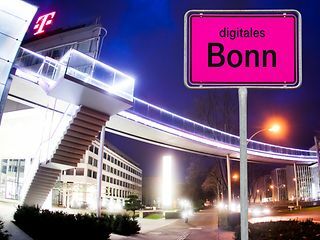 Deutsche Telekom is also committed to supporting Bonn with its expertise in smart city applications in order to help transform a digital vision into reality. For instance, it would be possible to equip Bonn's street lights with sensors that are only activated when a passerby is approaching. As a "sideline activity," this smart city lighting could also collect valuable environmental data. And we have a whole range of similar smart solutions aimed at making everyday life easier, for instance smart parking sensors that could help drivers in finding a parking sport or networked waste containers that signal when they are full and need to be emptied. All across Europe, Deutsche Telekom is already collaborating with various partners in several initiatives for developing solutions for parking space management, mobility management, smart street lighting, public safety and security and waste management. According to Mr. Höttges, however, it is important to step beyond these pilot projects and push ahead with a comprehensive implementation of these smart solutions. As digitization continues to spread, IT security plays an ever more important role. Networked things such as cars, PCs and smartphones are after all potential targets for hackers and criminals. Together with its partners, Deutsche Telekom has undertaken to develop effective long-term measures to combat cybercrime and the threat of cyberterrorism and to boost Bonn's image as "the capital of Internet security." To this end, Deutsche Telekom has set up its own Cyber Defense Center and established the business unit Telekom Security with the aim of developing integrated security concepts and providing the relevant security solutions from a single source. The new Bonn Digital Hub has already begun to take shape: the incubator for startups won the competition run by the state of North Rhine-Westphalia to promote the digital transformation. The underlying idea: the hub should be a platform networking scientists, students, technology specialists, startups, investors and regional businesses with the aim of promoting digital talents and ideas. "how we can tap the potential of the metropolitan regions in Europe as technology labs and improve the efficiency and sustainability of our infrastructures."